Did dinosaurs enjoy walking on the beach? Paleontologists have discovered a set of dinosaur footprints that seem to indicate social behavior in carnivorous dinosaurs. The footprints, found in northern Germany, belonged to two dinosaurs, one larger, and one smaller. Some 142 million years ago, a couple of dinosaurs were strolling in what later became the coast of Germany. The prints suggest they were in no rush, walking at about 3.9 mph (6.3 km/hour) for the large one and about 6 mph (9.7 km/h) for the little one. At some points, the smaller one seemed to be trotting, probably trying to keep up. 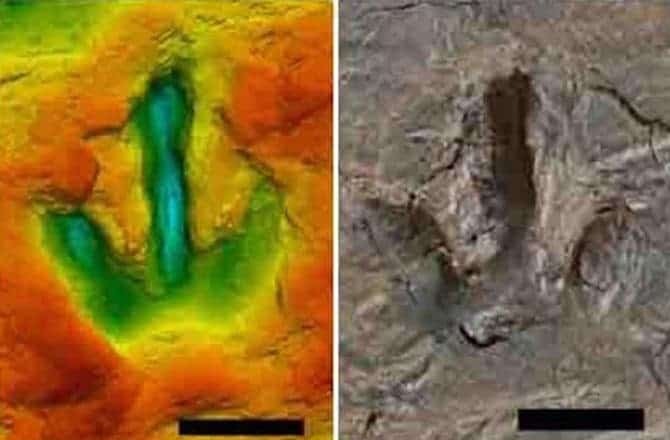 “The footprints show that the dinosaurs skid here and there as well,” says study researcher, Pernille Troelsen, having done his masters in biology from the University of Southern Denmark in June this year. Troelsen went on to explain that the animals were virtually walking on the beach at unusually slow paces. Her experience and background is slightly different from that of most paleontologists – she’s a biologist, and can contribute with different knowledge. “As a biologist, I can contribute with knowledge about behavior of the individual animals,” Troelsen said in a statement. We don’t know for sure what kind of dinosaurs these were, but we know something about their size. They were theropods, and the large dinosaur’s feet measured an average of 13.5 by 14.3 inches (34.4 by 36.4 centimeters). The small one’s measured an average of 9.3 by 9.3 inches (23.5 by 23.5 cm), or about a U.S. man’s size 6 shoe. But we know even more about them: the animals stood about 5.2 feet (1.6 meters) and 3.6 feet (1.1 m) at hip height respectively, and were almost certainly meat eaters. They were comparable in size (and probably behavior) to the Velociraptor – agile hunters. But social behavior in predator dinosaurs is rarely documented, and is still a matter of debate. The fact that these two were so comfortable with each other to slowly walk on the beach might indicate that they were parent and offspring, but it may have also been common in the day.